Last night, candidates vying to be Tennessee’s next Governor participated in a forum on education held at Belmont University and sponsored by SCORE (Statewide Collaborative on Reforming Education). Five of the seven candidates attended the event. Mae Beavers had a death in the family and was unable to attend. Congressman Diane Black cited a “scheduling conflict.” That’s typically political speak for not wanting to answer tough questions. Yes, Black is a Member of Congress and yes, Congress is in session. However, key votes on reopening the government after a brief shutdown had already taken place. Further, Black’s vote would not have been a pivotal one in that process. Diane Black is asking Tennesseans to trust her to lead the state and she couldn’t be bothered to join a forum and answer direct questions on one of the state’s largest expenditures and a top priority issue for voters. Now, a roundup of reporting on the candidates who did attend and participate: House Speaker Beth Harwell, House Democratic Leader Craig Fitzhugh, former Nashville Mayor Karl Dean, businessman and former Economic Development Commissioner Randy Boyd, and businessman Bill Lee. Here’s Chalkbeat’s report, noting a significant amount of agreement among the candidates on a range of issues. Every candidate said they want to boost pay for Tennessee teachers on the heels of two years of increased allocations under outgoing Gov. Bill Haslam. Former Nashville Mayor Karl Dean, a Democrat, offered the most direct pledge, calling higher salaries his “No. 1 priority,” while House Speaker Beth Harwell, a Republican from Nashville, gave a more restrained endorsement. “We have now given two back-to-back 4 percent pay increases to our teachers,” Harwell said. “Would I like to do more? Of course. And when the budget allows for that, I will.” On a related note, most candidates said it’s also time to revisit the state’s formula for funding K-12 education. Republicans said they would not sign legislation that would provide so-called “Dreamers” with the tuition break to attend the state’s higher education institutions, while Democrats said they would. “I’m the only person on this panel who has voted to do that, and I will vote to do that again,” Fitzhugh said of unsuccessful bills in Tennessee’s legislature during recent years. “It is cruel that we do not let these children that have lived in Tennessee all their life have in-state tuition,” he added. Republicans emphasized the letter of the law. “It doesn’t seem fair to me that we would offer something in college tuition to an immigrant that was here illegally that we wouldn’t offer to an American citizen from Georgia,” said Bill Lee, a Republican businessman from Williamson County. Fitzhugh was the only candidate who said that he and all of his children are products of public schools, and that his grandchildren attend public schools as well. Harwell: She cited “mixed results” of existing programs, wants to lean on nurturing high-quality options. Just where was Diane Black? Black declined to participate in the forum because of a scheduling conflict. According to an invitation obtained by the USA TODAY NETWORK – Tennessee, she was attending a campaign reception at Southeast Venture, a development firm near 100 Oaks, that cost $250 per couple to attend and included hors d’oeuvres. While I’m sure the snacks were nice and the haul of campaign cash significant, Tennessee voters surely expect a person running for the state’s top job to join with her opponents in answering relevant questions. 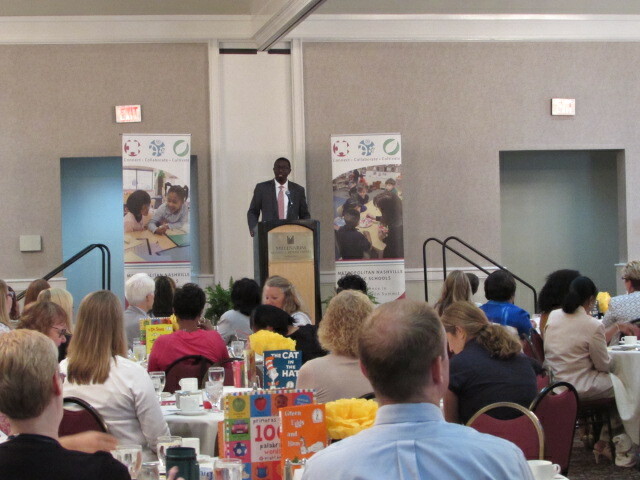 Metro Schools brought together early childhood educators, community partners and businesses to connect and collaborate at MNPS’ Excellence in Early Education Summit 2017 on June 21. Attendees learned about MNPS’ pre-K program developments throughout this past year, and the program’s work towards building quality pre-K across Davidson County. The summit also highlighted the milestones met through the federal Preschool Development Grant – Expansion (PDG-E), which has provided MNPS the opportunity to expand access to high quality pre-school programs by adding new classrooms and strengthening the quality of existing classrooms. Dr. Shawn Joseph and Mayor Megan Barry provided remarks during the summit focused on the importance of building a strong learning foundation to support and develop Nashville’s youngest learners. Dr. Elizabeth Alves, assistant commissioner for the Office of Early Learning and Literacy at the Tennessee Department of Education (TDOE), provided the keynote and discussed the importance of quality pre-K programs throughout Tennessee. MNPS Pre-K community partners participated in a round table discussion, including: Conexión Américas, Global Education Center, KinderCare, Nashville Public Library, MNPS Pre-K Comprehensive Services, MNPS Plant the Seed, MNPS Pre-K Coaching and Instructional Support, The Headstart Program (Metro Action Commission), United Way of Metropolitan Nashville and Vanderbilt Peabody Research Institute. During their presentations, they provided attendees with an overview of their organization, and discussed their work through the PDG-E grant and the impact they have had on Metro’s pre-K program and students. This is the second Excellence in Early Education Summit hosted by Metro Schools. The event was sponsored by the Tennessee Department of Education with Preschool Development Grant-Expansion Funds. The recently released results of a study of Tennessee’s Voluntary Pre-K program conducted by researchers at Vanderbilt has some Tennessee policymakers suggesting the state back off support for or expansion of the early education program. The results of this study are similar to those of a study on Pre-K commissioned by the Comptroller’s office. And here’s the secret: Both studies come to the same conclusion — Pre-K works. That is, the state’s voluntary Pre-K program sends students to Kindergarten better prepared. And the effects of the program last through first grade. That’s right, one year of intervention yields two years of results as demonstrated by two different Tennessee-specific, longitudinal studies. Here’s another secret: There are no silver bullets in education. Pre-K is one specific, targeted intervention. But Pre-K alone can’t solve the challenges faced by Tennessee’s low income students. Second, there is no single moment or intervention in the life of a child that guarantees success. But research has identified several milestones on the path to adulthood that especially determine success at later stages. This is where evidence-based programs can have the greatest impact. We know that a healthy and secure start in life is critical to the development of social and cognitive skills and other indicators of well-being. Entering school ready to learn is another vital marker. Parental education and access to high-quality preschool have been shown to improve a range of life outcomes, from earnings to crime. And kids who aren’t reading proficiently by 3rd grade are four times less likely to graduate from high school by age 19. Kids living in poor neighborhoods and not reading proficiently by 3rd grade are around nine times less likely to graduate on time. Entering school ready to learn is one vital marker on the path toward closing achievement gaps and giving children from low income families a shot at succeeding in school and life. But it’s just ONE of the several ingredients in a system that would actually put kids first and move the needle on educational attainment. This study was meant to monitor the effectiveness of Tennessee’s voluntary pre-K program. But co-investigator Mark Lipsy says it really raises questions about early elementary grades. Chetty specifically points to improved teacher training, early career mentoring, and reducing class sizes as policies that could work to improve the overall quality of early (K-3) classrooms. That is, it’s not enough to simply provide an intervention that sends kids to Kindergarten ready to learn and that has positive benefits through first grade, our state must also invest in the supports and resources necessary to allow early grade learning to build on the foundation established by Pre-K.
We know what works for our students. We know how to close the achievement gap. We know that quality Pre-K is one piece of the puzzle. And we know that two different longitudinal studies have shown that Tennessee’s Pre-K program is effective. The question is: Will we invest in expanding Pre-K and also providing the resources necessary to make not only the early grades, but all of school an environment where all children can thrive? Are Tennessee policymakers looking for the elusive silver bullet, or do they really want to find comprehensive policy solutions that help break barriers and close achievement gaps? More importantly, are Tennessee policymakers willing to invest in educational excellence from Pre-K through college in ways that are proven to have the most significant impact?